Just kidding. None of you, my dear readers, are bone heads. 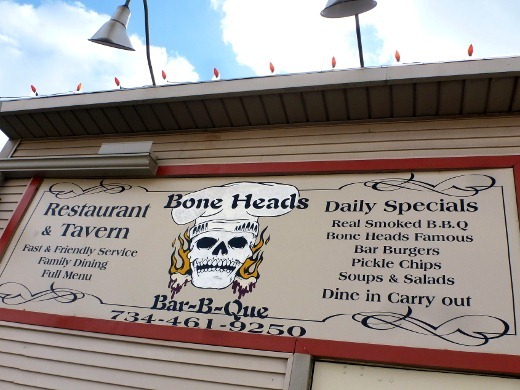 Unless you’ve never been to Bone Heads Bar-B-Que before. Then you might be a Bone Head. I should be a salesperson. His favorite way to celebrate big things in life is via meat consumption. He had the idea to try out this new-to-us BBQ joint in nearby Willis for dinner. 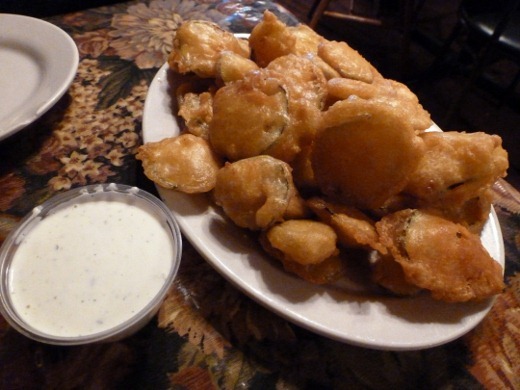 The huz is very carnivorous but he also appreciate a fine fried pickle. Clearly we enjoy the finer things in life. Alongside all that MEAT came baked beans, cornbread, coleslaw (not pictured), and a side of the huz’s choice (sweet potato). SO MUCH FOOD. Ribs were his top meat choice in the combo, and he said were excellent. Chicken must be his favorite food of all time (so, he has high chicken standards), and he said Bone Head’s chicken was his second favorite meat on the plate. I tried a bite of the chicken and it was smoky and so juicy – yum! My favorite item from his plate was actually the brisket. Lots of good stuff here. 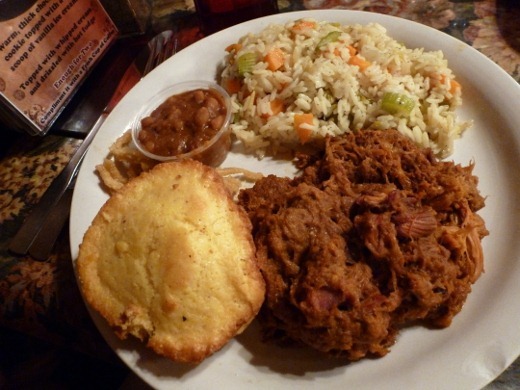 I ordered the slightly more modest but also very large Pulled Pork Dinner entrée, served also with a sample size of rich and savory baked beans, cornbread (a little dry, needs butter), coleslaw (not pictured – nothing special), and a side of my choice – rice pilaf. Okay, this is going to sound crazy but my favorite part of my dinner was the rice pilaf, dudes! It was surprisingly delicious. I was delighted by the giant pulled pork portion size. The pork was shredded into tiny pieces, and I actually prefer a chunkier shred, with meatier chunks, but this was still tasty pulled pork. One BBQ sauce is available, which was pretty good, but I would have liked to have seen more sauce options on the side. With that said, much extra sauce wasn’t really required anyways, since BBQ sauce was already incorporated into the pulled pork. I really wanted to try Bone Head’s macaroni & cheese, because that is often my favorite BBQ side dish. 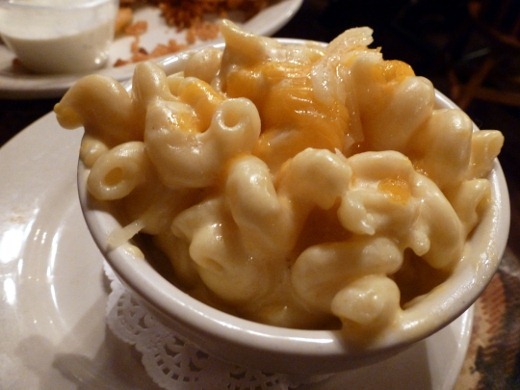 Most entrées are accompanied by the side dish of your choice, but macaroni & cheese is considered a more premium choice and not included in the options. All in all we had a very enjoyable meal with really good food. 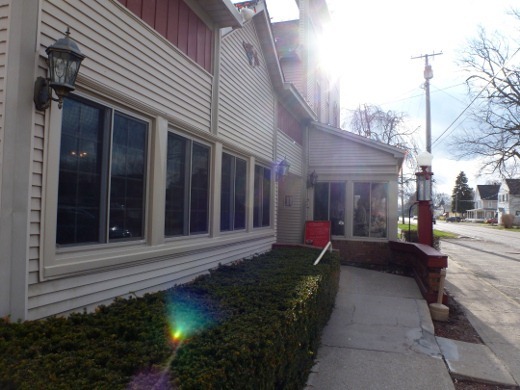 There is lots of seating (and parking) available at Bone Heads, making it a good choice when you want to beat the Ann Arbor crowds. Our service was a little slow, and we were slightly annoyed by some disturbing table and chair moving at the beginning of our meal, but all in all I don’t think it downgraded our experience. 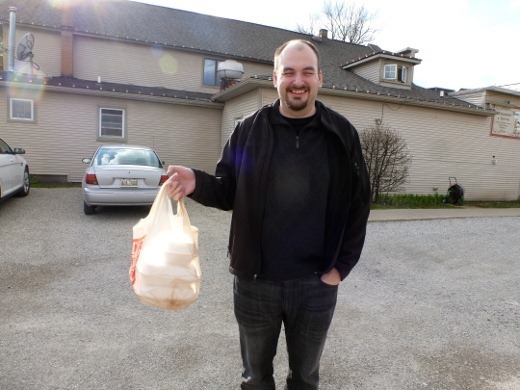 We were never left in need of a beverage refill, all food arrived accurately, hot, and fresh, and the staff we encountered were all pleasant enough. We really enjoyed the food – our minds weren’t blown away but everything we had tasted good (and in several cases, GREAT), prices were very reasonable, and our tummies were satisfied. The huge portions meant we had lots of leftovers! The dessert menu looks amazing and next time we will save room. Chocolate Chip Cookie Skillet! Carrot Cake! Chocolate Mousse! Yes to all, please! We definitely want to return to Bone Heads again. There are many other enticing food options we want to try from the large menu. 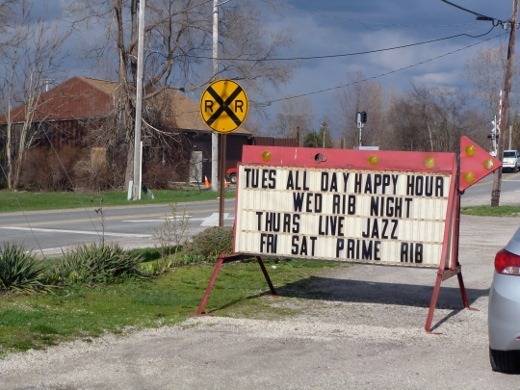 For one’s first trip, I recommend you try the pickle chips, ribs, and macaroni & cheese. Brisket, smoked chicken, and the rice pilaf were my other favorites. 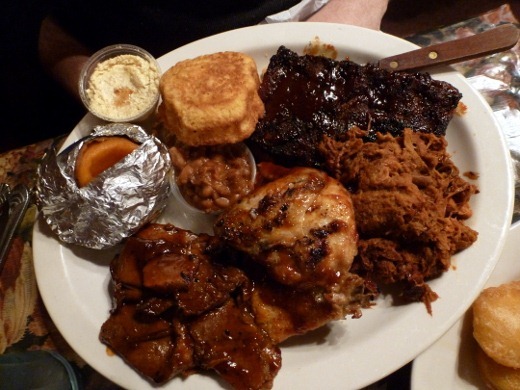 BBQ food is such a win. Pingback: Dinner Meal Plan for April 27-May 3 | Meg.Goes.Nom.Nom. Pingback: Dinner Meal Plan for October 6 – 12 | Meg.Goes.Nom.Nom.